Gifted telephone psychics waiting to take your call right now. Discounted psychic readings from just 29p per min for new customers. Genuine reviews! 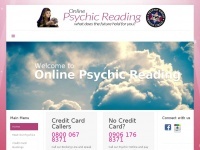 1 review has been written for Online-psychic-reading.co.uk yet. Had a lovely reading from reader Leanne. She knew lots of things about my current situation.